Requirements: Interns should have at least one year of experience or training in the business or management field. 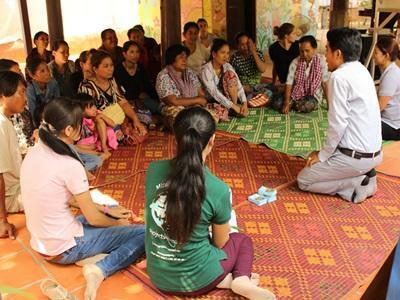 A Microfinance internship with Projects Abroad in Cambodia is an opportunity for you to help effect tangible long-term change in underprivileged communities. We work in partnership with the Khemara organization, one of the oldest NGOs in the country, to assist small-scale entrepreneurs in creating and developing businesses. If you have a passion for grassroots community development and helping to build businesses, you can make a significant impact through your internship. At this project, we facilitate small loans to disadvantaged individuals in Phnom Penh. Most of the people we assist are garment workers, who earn less than $3 a day sewing clothes for major brands. They work in appalling and unhealthy conditions. These workers are often women, many of whom have small children to care for. Most Cambodian families find it extremely difficult to set up businesses by themselves, as loans typically come with high commission fees and interest rates. The loans facilitated by Projects Abroad have neither. By providing start-up capital, training, and advice for small businesses such as shops and food carts, you will help people achieve financial independence and have more time to spend with their families. This project is a great chance for you to add useful new skills to your resume and gain an insight into the challenges entrepreneurs face on a daily basis in developing countries. It will also be beneficial for you to spend time in a completely new environment, learning about a different culture and way of life. If you are interested in contributing to this project, you will need to have at least one years’ experience or training in the business or management field. Anyone with significant business qualifications or skills is welcome on this project as well - local entrepreneurs will appreciate having the benefit of your knowledge and experience! The aim of this project is to provide entrepreneurs with small commission and interest-free loans, which over time and with guidance they will reimburse. As an intern, your role is crucial as you will help provide successful applicants with training in basic business accounting and other assistance that will help them build a profitable and (most importantly) sustainable business. This project runs all year round so you can join at any time. On a typical day, you will work from Monday to Friday from 8am to 5pm.